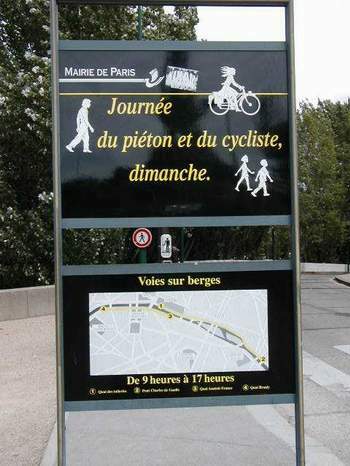 On Sunday, I was reading Pariscope (a weekly French publication that tells what's going on in the city) and discovered that the roads along the Seine on both sides are closed to auto traffic most Sundays, including this Sunday. 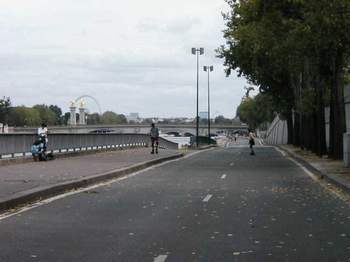 We had thought the days of walking along a car-less road on the Seine ended last Wednesday, on the Feast of the Assumption, when the month long closure of the right bank voie ended. 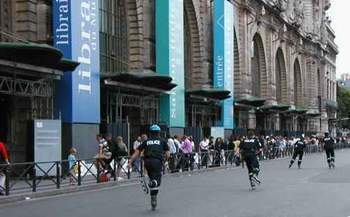 But no, it looks like this is an every Sunday thing, and we had not had this left bank experience yet, so off we went to the Day of the Pedestrian and the Cyclist, Sunday, on the left bank. 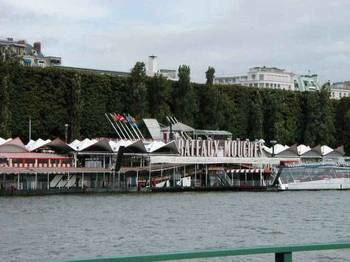 We saw the Bateaux Mouches (tourist boat) headquarters from the other side, for a change. 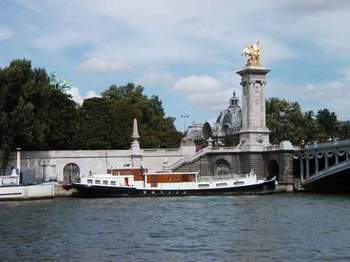 And here is Tom's favorite houseboat again, still docked at the right bank side of the Pont Alexandre III (my favorite bridge). 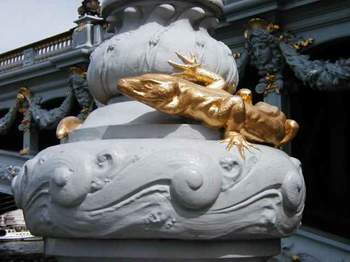 I love these salamanders on stanchions near the Pont Alexandre III. The pedestrian and cyclist way ended at the location of the Musée D'Orsay (which, by the way, was the former Paris-Orleans train station, a railroad line financed and developed by the Rothschilds, who, from the looks of this architecture, I am sure hired the architects to design this magnificent structure -- it has Rothschild stamped all over it). We were about to attempt to cross the street to find a café and VOILA! 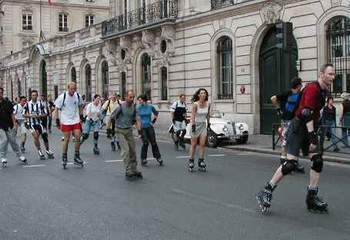 There was a group of police on rollerblades swooshing past. 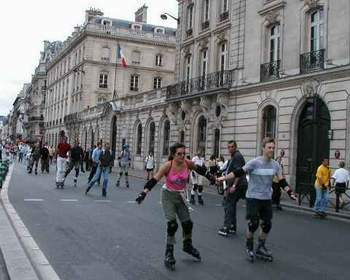 And then, much to our surprise, there were thousands of rollerbladers. I'd read about this every Sunday event which keeps growing larger and larger, but this is the first time we'd seen it. It was great fun to watch. Just as I had heard, the front of the pack includes the mostly male, very agresssive skaters. The whole time we watched this spectacle, a couple large, obnoxious male tourists from Britain were complaining about the inconvenience of having to wait to cross the street. We said nothing to them because they looked like the type who riot at soccer games. 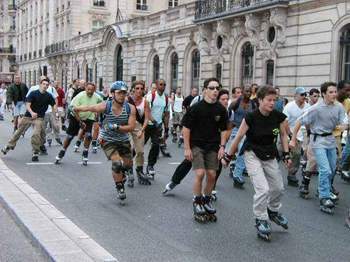 As the parade moved along, the skaters became more normal looking -- not so full of testosterone. And there were some who were even acting like romance-striken Parisiens. Notice the antique car parked on the far side. Its driver is in it -- I think he parked here and waited, knowing the show was about to begin. Nice way to spend a Sunday. 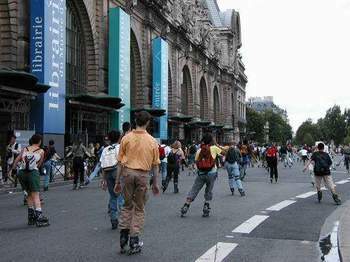 He enjoyed the rollerbladers, but the cars who followed the spectacle were impatient and were even honking horns! That doesn't happen all that much in Paris. More August 22 . . .